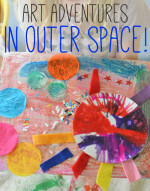 Process Art For Kids – It’s No Mess! I’ve worked with kids for almost 20 years and there are certain experiences that stick in my mind as truly magical. The common thread between all of them is some kind of process art that is almost always lead by the kids. 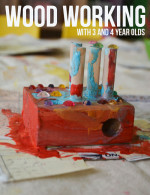 I am a firm believer in process art, especially for young children. It’s something that, unfortunately, so many kids don’t get to experience very often, if at all. I would define process art as a creative experience that has no expectations or determined outcome. It’s about the experience! Here is a great pinterest board for tons of process art activities to check out. 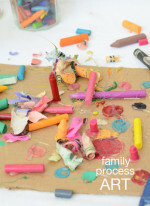 Having two toddlers, pretty much all the art we do is process art, but I recently had an experience that really reminded me of how important process art is for kids of all ages. My dear friend Lindsay stopped by for a visit the other day and I am sooo glad she did. My girls were asleep, which gave us the perfect time to chat it up in the playhouse while her beautiful children, Chelsea, almost 4 and Nate, 7, were able to dabble in whatever happened to be laying around the playhouse. I recently had some kids over for an art play date so there were a lot of materials to chose from. As my girlfriend and I caught up, the kids were pretty much on their own to create and explore. There was no plan, except for the moms to find some time chat, which as we all know, is no easy feat with kids around. I was very thankful mine were asleep! What happened over the next hour amazed and inspired me. The kids created the most gorgeous outdoor wonderlands I have ever seen. I couldn’t believe my eyes. They painted. They drew. They stamped. They sprayed water. They collected leaves and sticks. They squeezed glitter glue. They added birds. You name it, they did it. It was the most incredible creative process that brought forward such a wonderful sense of exploration and peace. Lindsay and I just kept peeking over, trying to contain ourselves. We barely said a word. We didn’t want to interrupt their flow. That’s the thing about process art for kids. It can be so subtle and so rich. I think one of the key’s is interesting materials. Paint is always good and there are so many different kinds. Adding bits of nature to art is totally inspiring for children. Having unusual objects around is a nice touch as well. For these kids, the birds were a big draw. All of a sudden Chelsea’s paint puddle became a beautiful blue lagoon, where her little birdie could rest her tired feet. Each world they created told such a distinct story. It was truly an experience to behold. One of my favorite things about process art is that the kids decide when they are done. Nate added so many layers to his scene. He started with stamping and with each passing moment his world began to take shape. To some, it might look like a mess, but this was no mess! It was purposeful, insightful, engaged creativity. So thank you Nate and Chelsea, for giving your mom and her artsy fartsy friend a fantastic afternoon. We got to chat and we got so much more! This is a beautiful, inspiring, AWESOME post. Have I told you lately that I love you? I can’t wait to see what you write this year!! Thank you Stephanie!!! I am so feeling process art lately. It’s so amazing! Thanks for inspiring me! It really IS inspiring- I so love this post and it makes me wish I was there! Process art is just so open-ended and you can just see it doing good things for little brains while they are engaged. What a privilege to experience the art process and artful ways of Meri! Thanks for including us on your beautiful blog. Wow! 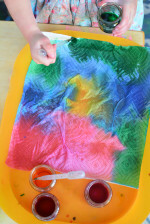 These pictures are gorgeous -they just make you want to get messy and make some art! Sharing with our Facebook followers and pinning! Thanks for the inspiration! Thanks so much Claire! Just liked your page on fb. Excited to check out your blog. What is Process Art for Kids & Why is It Important? - Fun-A-Day! This is honestly our most favorite way to get creative! I actually find it the easiest art to prepare for as well. We usually do our big mess artwork outdoors and that almost always guarantees the rest if the neighbourhood kids joining in. Makes the entire craft-art run smoother by using easily found items! 😀 Thanks as always Meri! Awesome! I love the idea of the all the neighborhood kids joining in. That is so awesome Jeanine!